Please note that updated, detailed data is linked from the resume below for 2009 or on our Economy page. 2009 was a very tough year for Romania’s economy, which proved virtually all forecasts from the year before wrong. Romania did not record the expected growth, but did a big step backwards after being hit by the crisis. Needles to mention, that no analyst could foresee such a development before the outbreak of the crisis, which happened to affect Romania beginning only during spring 2009 to its full extent. FDI inflows in the first quarter were even higher than in the first quarter of 2008. Yet, though higher than anticipated by the IMF, FDI in 2009 dropped likewise. Overall the Romanian GDP fell by some 7.7 %. The situation on the labor market – formerly characterized by notable shortages in labor supply and low unemployment – reversed completely. Main driver have been falling exports due to a falling external demand and bad access to credit as international finical markets froze. Internal demand, formerly heavily based on credit was the second main driver of the former growth and thus, of the recession in 2009. The only positive things to be mentioned are a relatively low inflation rate and a shrinking Current Account deficit. However, both developments are again the result of a massive breakdown of disposable income and credit, which also resulted in dramatically shrinking import volumes. A rapid and massively dropping exchange rate for Romania contributed significantly to this development. The public deficit continued growing and Romania was one of the first which had to apply for a credit at the EU and the IMF. Though the Romanian Government denied last year that Romania was in danger of declaring bankruptcy and the huge credit of 20 Bln Euro was meant just a “safety belt for the private sector” the credibility of this notion is still missing. The crisis between government and the president Traian Basescu did not ease the economic hardships, but delayed the payout of the second part of the IMF credit to 2010 and set the Romanian currency under further pressure. Coping with the political instability will be a major task for 2010 in order to strengthen the credibility in Romania and its economy. For 2010 the economy of Romania is widely believed to start recovering, yet slowly and not all of the massive drawbacks can be overcome in 2010. Especially the Romanian labor market will remain in a bad shape. 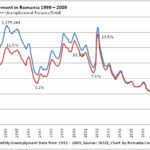 The former level of unemployment in Romania of just some 4.4% is not expected to be reached again before 2014, though a first decrease of 1.4% to 6.2% is expected for 2010. Real wages in Romania experienced a negative growth -2.3% though average gross salaries grew by some 5%. However, the times of double digit growth rates seem to be gone for the next few years when it comes to salaries in Romania. The GDP of Romania is estimated to grow by 0.5% during 2010 (CNP, some banks even estimate a growth up to 1.9%), but the former level of 2009 will not be reached before the end of 2011 according to the latest CNP estimations. The very same is true for exports from Romania, which have been a main driver of growth during the past years. Inflation is believed to remain on the low side for Romanian standards, yet still on the high side for overall trends in the EU. The Exchange rate for Romania’s currency is estimated to stabilize at 4.25 RON/EUR, yet this estimate has not remained unchallenged. Several analysts expected the LEU to drop until 4.5 RON/EUR. On the other hand, during the first half of January 2010 the RON appreciated considerable for some days, but without convincing that the effect will stand the test of time. Note on the data: The CNP data for the past years exhibits some minor inconsistencies with the data provided by INSSE (Institutul National de Statistica). However, the trends overall are still consistent and under the current conditions good indicators. The overall conclusions for the economy of Romania in 2010 can be summed up with that times remain though.